Finally, after waiting forever to get a new update in the lives of Carrie, Samantha, Charlotte & Miranda, last night I got to see SATC2!!!!! It was a charity screening (which meant they got to charge $40 for a movie ticket & a cosmo. at least I got a goodie bag which wasnt really that good) at The Palace in Leichhardt. My friend from work Mands organised it (ie sent the link to buy the tickets) so along with her, a few of her friends, another friend from work B (Bianca) and her friend Michelle and my cousin Rosie, we met, drank the obligatory cosmo with a horde of giggly and excited women and sat in the darked cinema, armed with popcorn, lollies & a glass of wine, awaiting the great colourful event that is SATC2! OTT doesnt begin to describe this movie! It.Is.Fabulous!!! Apparently critics have panned it, but I dont care! I LOVE the girls and their fashion and their men and their commentary on real womens issues and especially their friendship. This is 14 years, 6 wonderful seasons & 1 movie of back stories all leading to this! As usual the dialogue is clever, witty & thoughtful. It makes sense. Its a perfect sequel. It makes you feel happy to be a woman. It relishes in friendship. It demonstrates that even as you grow older, get married, settle into a routine, have kids, dont have kids, struggle with work, menopause and self doubt, you still have your girlfriends to lean on and you can still have fun. The women are all aging, but its nice to see strong women characters that arent the usual Hollywood age (ie nothing over 40) and we wont think too hard on the stereotyped Arabs portrayed, as its supposed to be a feel good movie, not a political commentary. The message is simple and may as well be in huge flashing lights – Ladies dont lose your womanhood and sense of self! You matter. And what you think and feel matters. And especially, you make your own rules when it comes relationships & marriage. Plus there are hot guys!!! – the “Australian rugby team”, Big, Aidan, the Danish architect & Smith! I loved it. And if you’re a fan of SATC, so will you. PS – the soundtrack is awesome! 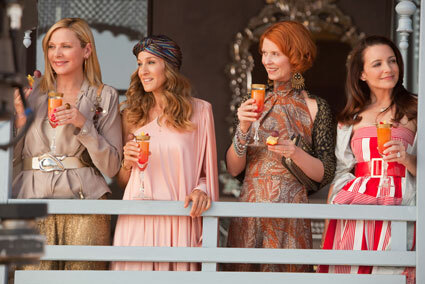 PPS – there are so many amazing outfits (some really really wrong ones too: ie the hat that Carrie wears in the plane. WTF?) but my faves were everything that Miranda wore, the white jumpsuit Carrie wears at the pool, the dress she wears to dinner with Aidan & the green dress at the end of the movie. Fashion to_die_for! if i had a chance, i’d ask the world to dance: for my friend Tam.